Come See Our Large Indoor Warehouse of Cars! Come See Our Large Indoor Warehouse of Cars! 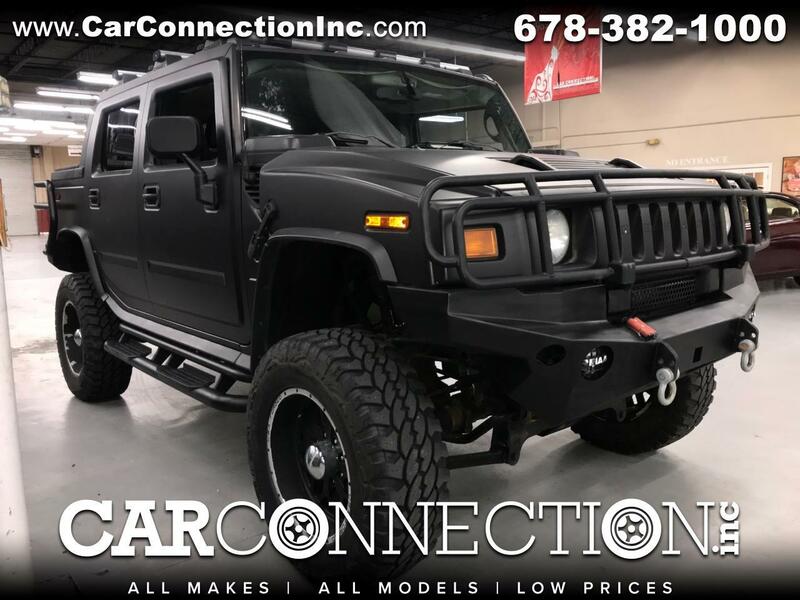 Gorgeous Matte Black Hummer H2 SUT Model with Black leather! Sunroof! Lift Kit! Excellent Condition! Low Miles! -- For added peace of mind, we offer a 3 Month/3,000 Mile Warranty on ALL our vehicles, regardless of mileage! AND All Car Connection vehicles are delivered with a 3-Day/300 Mile No Questions Asked Return Policy. Ask your Sales Agent or Finance Manager for details! We have the highest rating with the Better Business Bureau for Customer Service and Satisfaction! We have been serving our Credit Union Members and the Non Credit Union public since 1989! Car Connection exclusively offers PermaFinish, the Formula XV-9 Chemical Process that ELIMINATES the need for waxing and protects your vehicle's glossy finish for 6 YEARS, Guaranteed! Discounted Member Price for Only $499.00. Ask your Sales Agent of Finance Manager for details Visit www.permafinish.com for more details. Car Connection makes every effort to provide to you accurate information. However, we are not responsible for errors that appear on this vehicle. Sometimes vin decoding pulls erroneous information. Please verify any specific equipment at time of delivery to ensure those options are present that are difficult to detect. Come See Our Large Indoor Warehouse of Cars! --- For added peace of mind, we offer a 3 Month/3,000 Mile Warranty on ALL our vehicles, regardless of mileage! AND All Car Connection vehicles are delivered with a 3-Day/300 Mile No Questions Asked Return Policy. Ask your Sales Agent or Finance Manager for details! We have the highest rating with the Better Business Bureau for Customer Service and Satisfaction! We have been serving our Credit Union Members and the Non Credit Union public since 1989! Car Connection exclusively offers PermaFinish, the Formula XV-9 Chemical Process that ELIMINATES the need for waxing and protects your vehicle's glossy finish for 6 YEARS, Guaranteed! Discounted Member Price for Only $499.00. Ask your Sales Agent of Finance Manager for details Visit www.permafinish.com for more details. A 3 Month/3,000 Mile Warranty is offered for ALL vehicles, regardless of mileage. Ask a Finance Manager for details. All Purchases come with a 3-Day/300 Miles "No Questions Asked" Return Policy. Ask your Sales Agent or Finance Manager for details.